PAL is offering lots of affordable tickets via this Philippine Airlines YEAR END Sale!!! Ticket on sale are for select domestic and international destinations for the months of January, February, March, April, May, June, July, August and September 2019. And speaking of PAL International Destinations, this Philippine YEAR END SALE offers cheap tickets for Round Trip Flights. Yes, round trip flight!!! Rates are sold for as low as 79 USD Base Fare….. Yes, for less than 5K Pesos BASE FARE, you can book international round trip flights via Philippine Airlines. But since this is a BASE FARE promo, passengers still need to add for other fees and charges like Terminal Fee, VAT, Ticketing Service Fee and others. The Philippine Travel tax is also NOT Included. 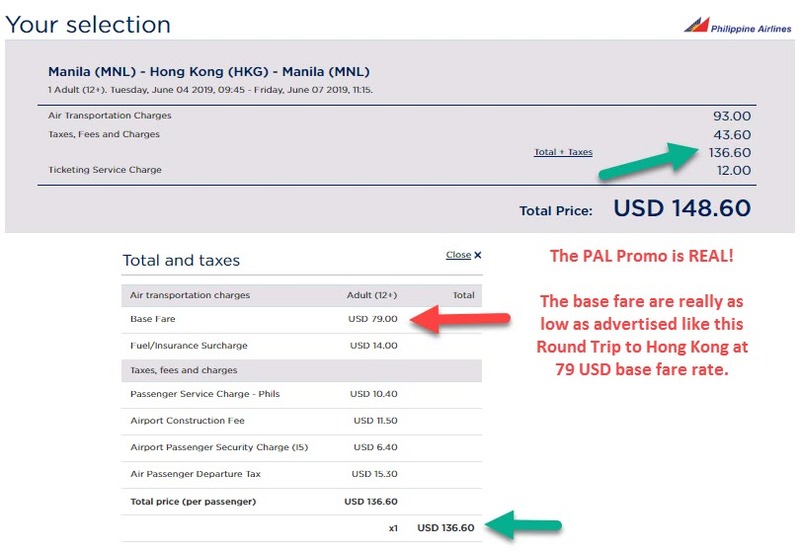 See the international flights and their Base Fare rates that are part of this PAL promo fare for 2019 flights. See what’s happening in China for the New Year!! More promo fares from Philippine Airlines Year End Seat Sale! Get your documents ready and apply for Tourist VISA for JAPAN and SOUTH KOREA for these tickets are very affordable!! AUSTRALIA and NEW ZEALAND here we come!!! MISS your Mom or Dad who are working in the Middle East, why not visit them for once?!! Visit AMERICA, UK and CANADA for your Ultimate Dream Vacation!!! No need to go to Manila for you can travel abroad via the Queen City of the South. Booking starts November 10 up to 25, 2018. Best to book online at www.philippineairlines.com. Travel starts January 16 and will end on September 30, 2019. Please LIKE and SHARE this post mga ka 1 Piso Fare Friends…. Happy Booking and Safe Travel always!!! Are these fares true? Because when i check with airline’s website, rates are different. A lot, lot higher than your quotes. The promos are true po. Example: we just search for this Manila to Hong Kong to Manila ticket one minute ago after reading your comment, nakakita agad kami ng promo as advertised for this destination which is 79 USD base fare promo rate. We checked with the PAL website. Your MNL SYD MNL fare is $349 but the website quote is P25,000+. So pano yun? If i want to buy the $349.00 fare, where do i go?